Here is the story of two stocks which, this week, announced earnings. I had long positions in both these stocks coming up to the announcements however my treatment of the two trades differed. But first, I will explain my general approach to trading stocks and earnings. I have a clear rule in my trading plan that I will avoid initiating trades in stocks within a certain timeframe of the scheduled earnings release. The rationale for this is that, in any position I take, it should have sufficient time so that, should price start to move in my favour, I will build up a reverse of open profits in that trade. 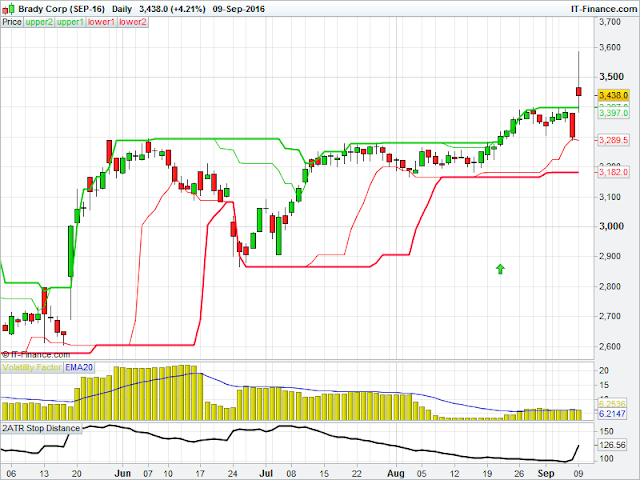 This potentially will create a price 'cushion' should price reverse or gap against me following earnings. I have seen too many examples of stocks on my watchlist breaking out a day or two ahead of earnings (almost to tempt me in to taking a position) only for price to then gap down. Without my profit 'cushion', this could potentially cause a loss more than -1R. With my own approach, while there is still a possibility that I may lose more than -1R should earnings cause a price gap against me, I am more prepared to take that risk if I am sitting in profit. So going forward the only price level that matters to me is that of the trailing stop, which I will update as required based on the chart and my price channels. In this instance, the stock had slowly moved up, and on Wednesday's close was primed to attempt to breakout to further new highs. However, on Thursday price action was such that all the open profits evaporated, and the trade actually went into a small loss. You can also see how price touched the trailing stop (the thin red line), even though my actual stop was placed just below that level. 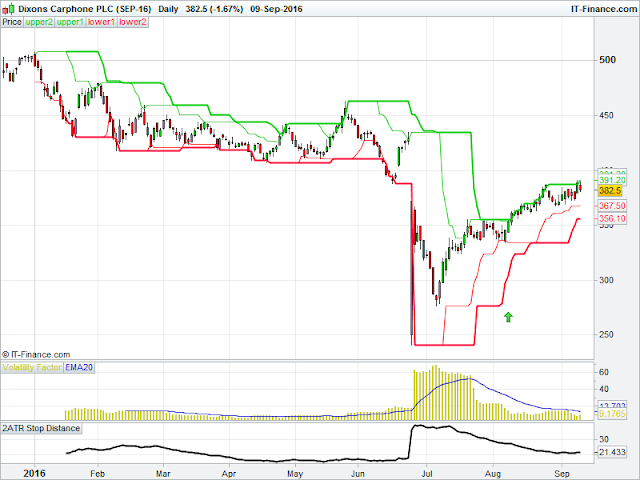 This price action concerned me - I had lost my cushion should price gap down following the earnings release. Therefore I had no hesitation in closing my trade, as per my own rules. The difference here is subtle but important - in the first trade, I was prepared to let the trade run. I was in profit, and I didn't want to limit the potential gains. In the second trade, it had turned from a profit to a small loss immediately prior to the earnings announcement. 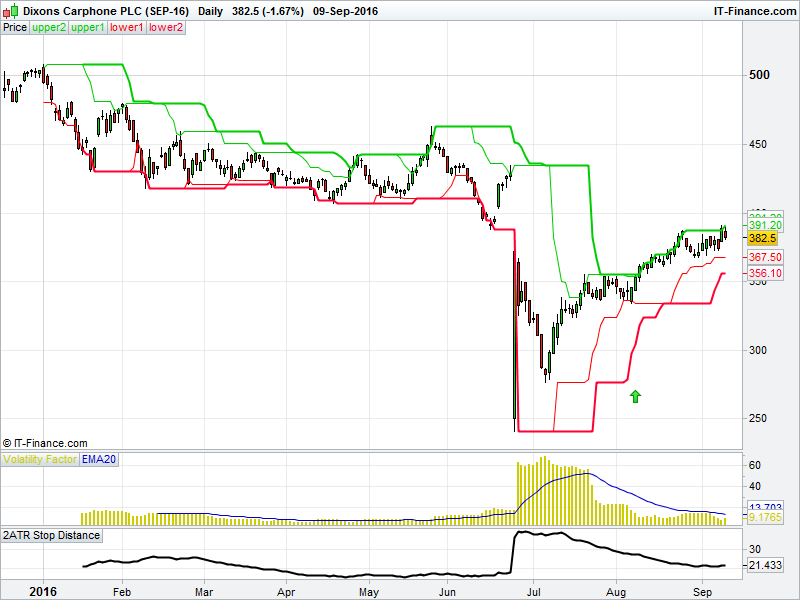 I had lost my profit 'cushion' against an adverse price move following earnings. So I cut the trade. The irony here is that, following earnings being released ahead of Friday's open, Brady Corp gapped up 5% or so. Had I held on (and overridden my rules) then I would have been back in profit with price making new highs. That is trading for you! No doubt some Hindsight Harry will say I did things wrong. What I did was right - for me. I followed my rules to the letter, and I felt no discomfort when I saw what happened. The trade had been closed, and emotionally wiped from my mind. You might find it odd being pleased that I missed out on making profits. What I was pleased about was the ability to follow my rules. While in this case it left me on the sidelines, over the next 1,000 or 10,000 trades the ability to follow those rules will benefit me many more times over. My no.1 goal as a trader is capital preservation. My actions were consistent with that goal. You also need to evaluate whether you are prepared to accept the risk on each trade in order to achieve the potential reward. In the first trade, I was. In the second, I wasn't. Because I had lost my open profits and was now sitting on a small loss, I was not prepared to take the risk of a small loss becoming a bigger loss. 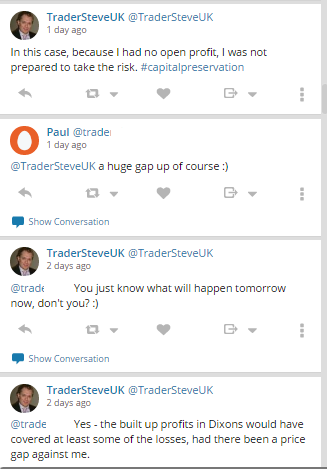 The majority of losing traders would have taken the opposite approach to both these trades - they would have closed the Dixons Carphone trade for fear of losing those open profits. They would have held onto the Brady Corp position in the hope that price would move back in their favour. The danger of doing that is that you think you have been smart by overriding your rules. Ego would now potentially come into play going forward. Confronted by a similar situation in the future, what will that trader do? Dangerous new habits could be formed. 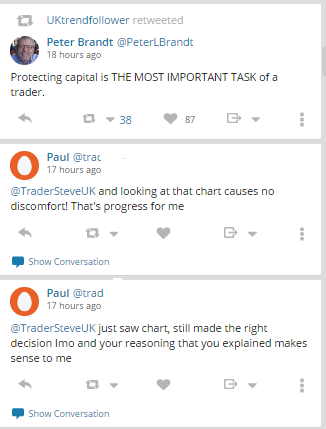 Remember that your trading rules should enable you to exploit your own 'edge' in the market. If you override those rules, by inference you are overriding your edge. And while you may get lucky on one trade, where will that get you over the long term? Great post Steve. Thanks for sharing your methodology for managing risk around earnings. This is something I'm always thinking about, and will likely try to incorporate some of your ideas about profit cushions. Thanks as well for being so honest with your approach (Hindsight Harry's be damned!) Because as you correctly say, the fact that you stuck to your system is what matters most, after all. Thanks for your comments Jay. Glad you found them of use! Thanks Felix! It is a boring cliche for a lot of people, but concentrating on following your process, rather than focusing on the potential income, will help you achieve that outcome. Also, it is very difficult for people to suppress their emotions as to an outcome. What people need to do is ensure that any decisions are taken with as little emotion driving them - such as fear, greed and hope. Get over any emotions before making any further decisions or taking further actions. If such decisions/actions are emotionally driven, then it is possible to compound the original error or issue. The act of decision making needs to made as objectively as possible. The NLP technique of disassociation (observing yourself as another person) can be beneficial in achieving this.